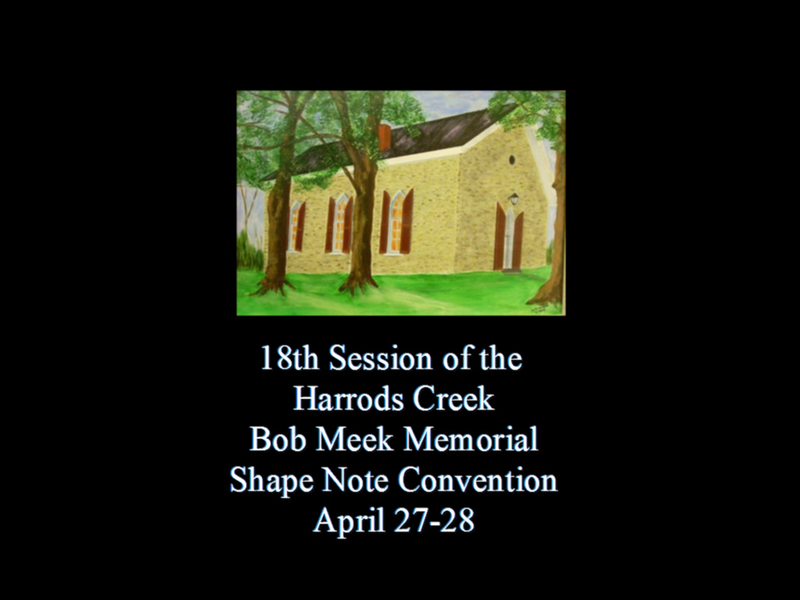 Spring means three things in Louisville: Thunder Over Louisville, The Kentucky Derby, and the Harrods Creek Bob Meek Memorial Shape Note Convention. This, the 18th Session of the convention, will take place during the weekend between Thunder and Derby. Here is the schedule of events. Enjoy a time of welcoming out of town guests and enjoy some fried catfish, freshly prepared by own own Michele Cull and family. Singing has been known to spontaneously break out now and then. Using several different Shape Note hymnals, people from all over the country will lead everyone through their favorite songs. Dinner on the grounds around lunch time. Singing ends around 3:00p. Also held at Harrods Creek Baptist Church, this is a time to sit back and enjoy a meal together. It’s chili with a secret ingredient. Can you guess what it is? Harrods Creek Baptist Church is easy to get to from Louisville. Head north on I-71 to exit 14, then turn left under the freeway. The church is about a mile and a half down Hwy 329 and will be on the left. For more information about this event, please contact Vine Street Baptist Church at 502.585.3027 and leave a message. Someone will get back to you right away.